Let your business card stand out from the crowd! Our Nick Dawson template is crafted from our 30pt Hard Suede and is custom sized to be especially unique to match the character and charm of your business. Two sided gold metallic ink and black foil create an elegant look while the simplistic but modern design is perfect for attracting attention. Luxurious and extravagant, this would be an ideal companion for those in the fashion or real estate industries that are interested in making a bold statement about the quality and sophistication of their business. With contrasting colors and an outstanding shine, this design actively endeavors to steal the spotlight, and does so with absolute ease. Recipients will not only be impressed with the exquisite and fearless portrayal of grandeur embodied by this template, but will associate such lavish designs with the same quality services and products provided by your company. Our Soft suede cardstock provides clients exactly what it advertises; plush and lush suede like texture. This high-end cardstock is an excellent option for clients wanting to set themselves apart from the competition. The 25pt thickness of this beautiful cardstock is fit for foil stamping, embossing, and metallic ink. 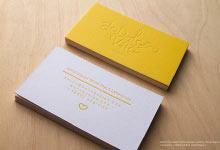 Offered in both cream and black in colour this cardstock is perfect for elegant and simple designs.